Halloween is the perfect time to throw a party for kids and adults of all ages. And who doesn’t love themselves a little cheese and cracker spider or candy corn quesadilla? 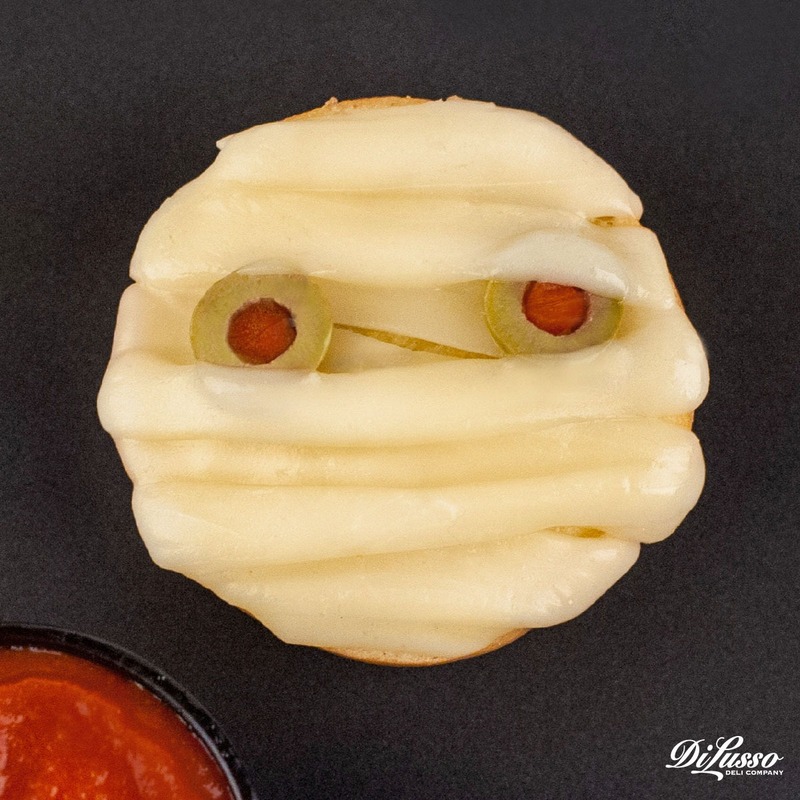 Fun to make and even more fun to eat, we’ve got a line up of frighteningly festive finger foods to add a little spooky to your Halloween party fare. Mummy loves you. And she loves Mummy Melts too. These tasty mini bagel pizzas will follow you around with their piercing green olive eyes peeking through strips of DI LUSSO® Provolone cheese. Just a few minutes in the oven until warm and melty. Mummy recommends a little pizza sauce for dipping too. 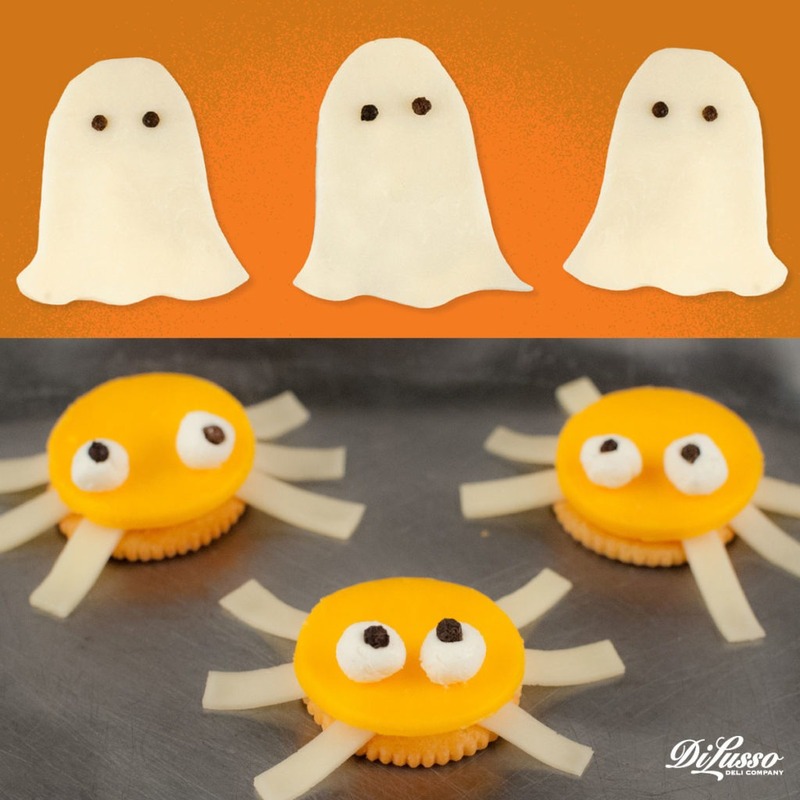 What respectable Halloween party is complete without Cheesy Ghosts and Spider Snacks? DI LUSSO® Provolone and Cheddar cheese slices are the main event here. With cream cheese and peppercorn eyes, you just might get the feeling you’re being watched. Hmmm… so far we’re three for three on snacks with eyes. Spooky coincidence? Those of you who are a little squeamish, be warned. 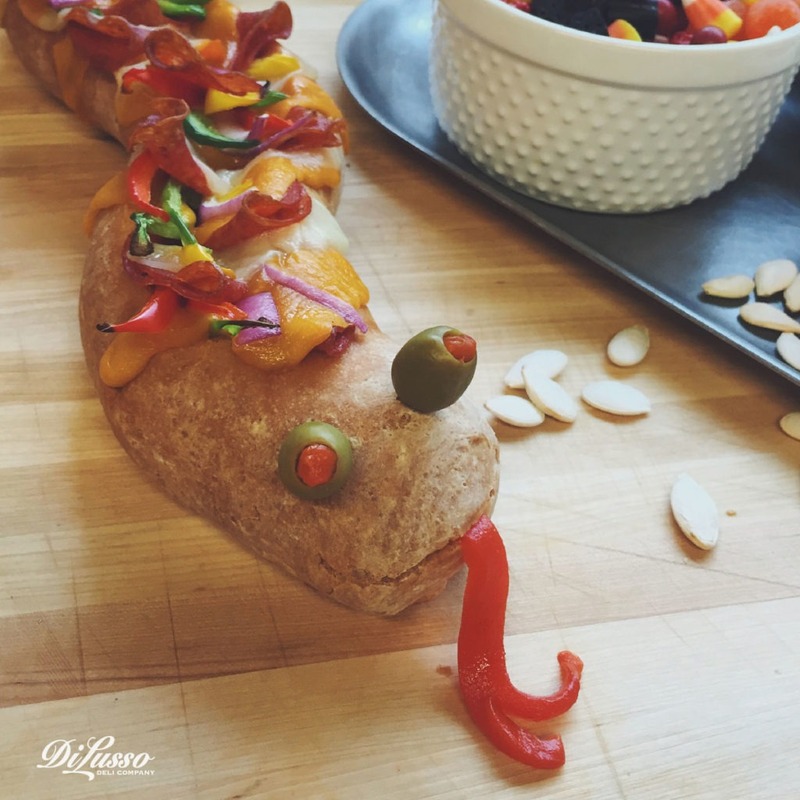 Our Pepperoni Sandwich Serpent is not for the faint of heart. But it is for the hungry hearts. Serve it as a main dish to be shared and quickly devoured. 1. Start by thawing out a 16 ounce loaf of frozen bread dough and form into a serpent-like “S” shape. Let rise and bake according to directions. Pssst! We won’t tell if you want to cheat with a heat-and-eat baguette, though your serpent will lose a little of it’s slither. 2. Hollow out the center about 1-inch deep and leave a couple inches on each end. 3. Begin filling the sandwich with a layer of pizza sauce and DI LUSSO® Pepperoni slices. 4. Add a layer of DI LUSSO® Provolone and Cheddar cheese slices cut in half diagonally. 5. Repeat layers until nearly filled. 6. Sprinkle the top with red, green and yellow sweet bell pepper strips and chopped mushrooms and onion. 7. Bake for 15 to 20 minutes at 350F or until heated through and cheese is melted. 8. Add a roasted red pepper strip for the tongue and a pair of pimento-stuffed green eyes. All witches and warlocks will love a candy corn quesadilla. 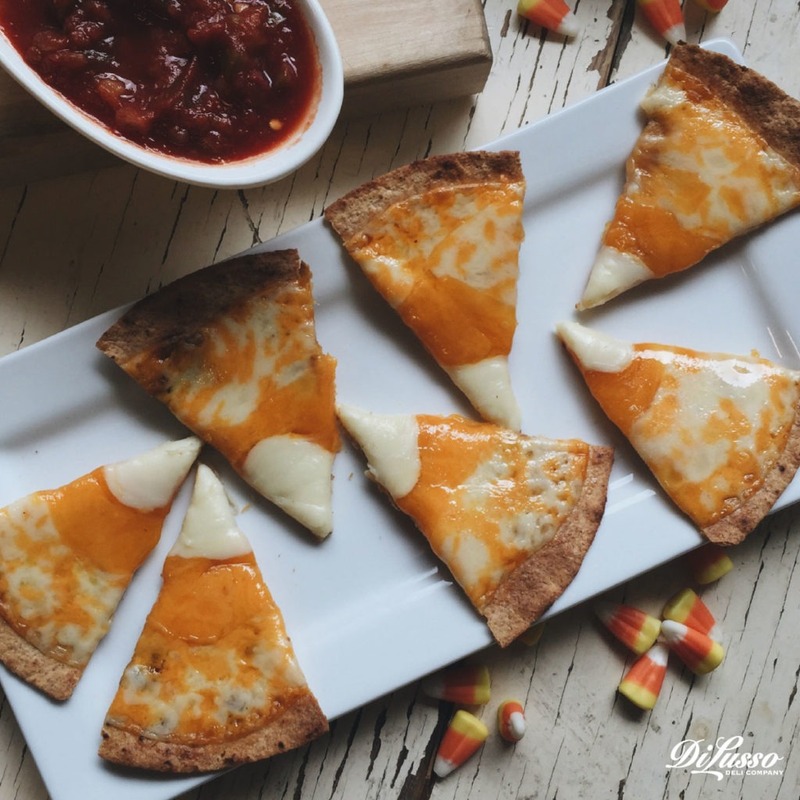 Striped in a pinwheel fashion with DI LUSSO® Cheddar, Colby Jack and White American cheeses on top of a flour or whole wheat tortilla, this Cheesy Candy Corn Quesadilla will have you thinking that Halloween ought to be a monthly celebration. Ok, weekly. Don’t be scared to tap into your inner goblin and get creative with delicious and fun toppings. Green peppers, chunky salsa, maybe some black olive eyes.